AFRICAN QUEEN ’52 LB 3 SH POSTER KATHARINE HEPBURN HUMPHREY BOGART CLASSIC LOOK! Overall displays in Very Good to Fine Condition. THE AFRICAN QUEEN (1952)Size: Original U.S. Three Sheet (41″ x 81″).Condition: Overall displays in Very Good to Fine Condition. Original linen-Backed Three Sheet for the classic and only teaming of Katharine Hepburn & Humphrey Bogart, THE AFRICAN QUEEN, displays fold line, cross-fold & fold wear touch-ups, otherwise features rich color and strikingly beautiful, painterly artwork! RARE!! !Please refer to the attached images and enlarge for a detailed view of this original linen-Backed Three Sheet for the 1952 classic, THE AFRICAN QUEEN. LINEN BACKED!! 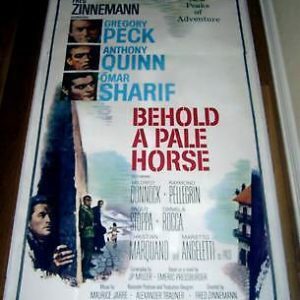 BEHOLD A PALE HORSE 3 SH '64 QUINN SETS TRAP FOR PECK! LINEN BACKED!! 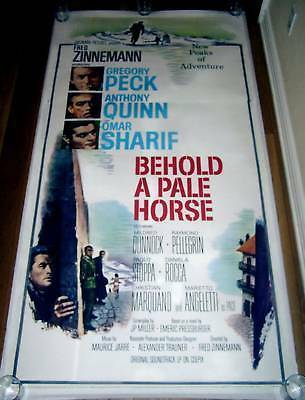 BEHOLD A PALE HORSE 3 SH ’64 QUINN SETS TRAP FOR PECK! 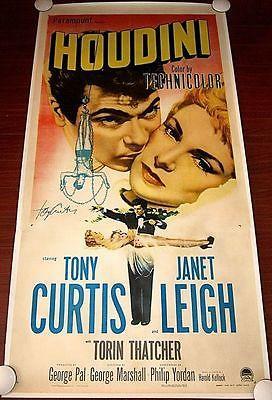 HOUDINI '53 LB 3 SH POSTER JANET LEIGH & TONY CURTIS AUTOGRAPHED BY TONY CURTIS! 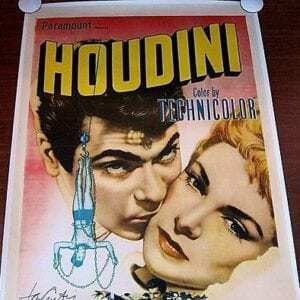 HOUDINI ’53 LB 3 SH POSTER JANET LEIGH & TONY CURTIS AUTOGRAPHED BY TONY CURTIS! CUT $90! ST. LOUIS BLUES '58 LB 3 SH KING COLE KITT & ELLA FITZGERALD! JAZZ! CUT $90! ST. LOUIS BLUES ’58 LB 3 SH KING COLE KITT & ELLA FITZGERALD! JAZZ! 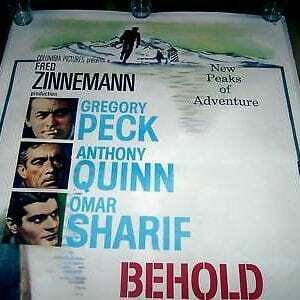 CUT $100 COOGAN'S BLUFF '68 LB 3 SH POSTER EASTWOOD IN NYC INSPIRED MCLOUD! CUT $100 COOGAN’S BLUFF ’68 LB 3 SH POSTER EASTWOOD IN NYC INSPIRED MCLOUD!